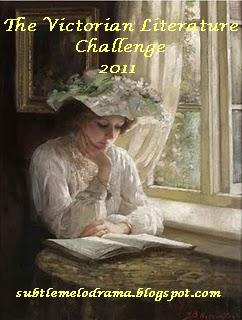 A Literary Odyssey: 2011 Victorian Literature Challenge. There is no way I couldn't sign up for the Victorian Literature Challenge hosted by Bethany over at words, words, words. I mean, I do love most Victorians and this will be an excellent kick in the pants to read some of their work...and some of that work by that reader I hate (you know, that Dickens chap). And, like said in another challenge sign-up post, this challenge serves as a great way to get more books read off my list (I am only signing up for challenges that allow me to do so, and I figure that challenges are a great way to reach out into the book blogging community). I'm aiming for some middle ground and while I am reaching for some Hard Times, I might just get to Great Expectations. (haha). Yaay! Nice list - though I see some quite yucky ones there too. Well, Heart of Darkness, basically. Dracula is great fun, and my heart belongs to Thomas Hardy so I'm pleased about that choice too! The Woman in White was lots of fun! It's a thick book, but I read it in just a few days. And Heart of Darkness might have taken me three reads before I realized it was a very good book and not the worst book in the history of books. So I'm excited to hear your perspective on it. I'm currently reading Daniel Deronda by George Eliot, but I've heard Silas Marner is very good too. Hmm...it's been a while since I've read any Victorians, but I've been a fan in the past. I haven't read A Woman in White, but the other Collins I've read were fun reads. I loved Dracula, too, (I've read it twice!) and have enjoyed Elizabeth Gaskell, although I haven't read the novels on your list. Overall, I'd say you have some great books to choose from, even if you want to avoid Dickens. Have fun! "Anyway, we’re both reading Oliver Twist and Dracula. We should coordinate. It would make reading Dickens much more enjoyable for me." I loved, loved, loved Wives & Daughters -- I think it's a better read than Cranford, despite the length. I also strongly preferred Middlemarch to Silas Marner, again, despite the length. MM started out a bit slow but was so worth sticking with! Vanity Fair was a bit of a chore. I also quite liked Dracula, a pleasant surprise, and Treasure Island. However, I must warn you against Hard Times!! It's the only Dickens besides Christmas Carol that I truly disliked. It's his shortest work but I didn't like anything about it. Oliver Twist is MUCH better. Hi, Allie! =) I'm doing this challenge, too, and comparing book lists. Well, you and I have Dracula in common . . . but I'm doing different stories by Sir Arthur Conan Doyle and Robert Louis Stevenson. I just joined this challenge too! I'm excited to have a group to read Victorian lit with. You've got some great books on your list.